Prawns in a crispy batter, served with sweet chilli dip. Crispy battered prawns with a sweet chilli sauce. 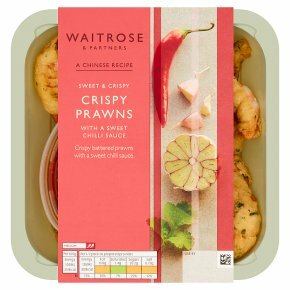 INGREDIENTS: Prawn (crustacean) (32%), rapeseed oil, sugar, water, maize flour, fortified wheat flour (wheat flour, calcium carbonate, iron, niacin, thiamin), distilled barley malt vinegar, cornflour, rice flour, red chillies, tapioca starch, wheat flour, chopped coriander, garlic, garlic powder, raising agents (sodium hydrogen carbonate, disodium diphosphate), ginger purée, white pepper, flavouring, salt, sunflower oil, paprika, colour paprika extract, yeast, rice vinegar, fermented soya bean, wheat.